I don't make fried chicken often, but when I do, I go all out. The last time I made Southern fried chicken for the blog, it was in 2008. I got fancy and brined my chicken in orange juice and vinegar. This time around, I wanted to keep it classic. Fried chicken should be juicy on the inside and crispy and crunchy on the outside. The skin is the best part. The skin is the most coveted part. The salty, spicy, crispy skin yields to your teeth and when you crunch down on it--it satisfies your Southern fried soul. And the meat inside should be silken, succulent, lightly briny and juicy. How do you achieve that crust? That juicy meat? I can show you better than I can tell you. 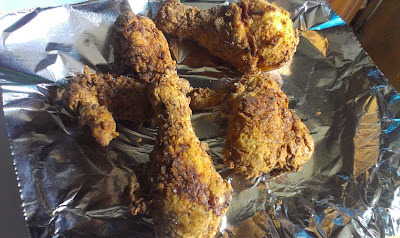 Watch my video on how to marinate your chicken in preparation for frying. It's only one minute long. I think you can handle it. I forgot to mention it, but I used 1/2 cup of hot sauce in the video. *If you use white wine the flavor imparted to your chicken will be very mild and light. *If you use lemon juice, the flavor will be slightly more tangy and citrusy. The longer you marinate, the better your chicken will taste. I marinated mine for 2 days. This fried chicken is not one of those 30-minute meal deals. It takes a little planning. 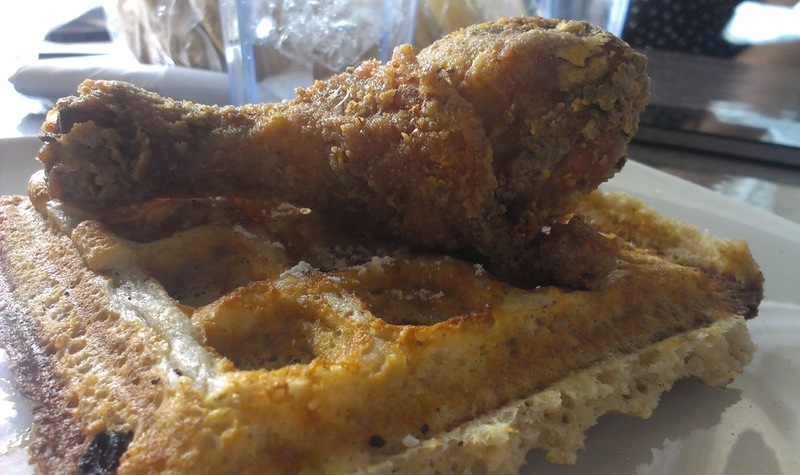 Fried chicken is special. 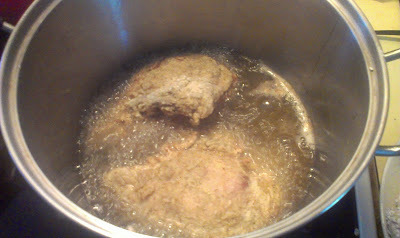 My grandma would make fried chicken on special occasions in the famous cast-iron skillet. The skillet would be filled to the brim with bubbling oil and battered chicken. There was always a mere centimeter between the rim of the pan and a kitchen fire. I'd sit at the kitchen counter and watching the oil rolling, washing over and bubbling over the chicken. Like magic, the flaccid chicken pieces would turn into golden brown hunks of goodness with crispy shelves hanging on, waiting for me to pinch off and enjoy. I am not as adventurous and I don't want to toy with a potential grease fire, so I always fry in a deep, tall stock pot. It's got a heavy bottom and high sides so the popping grease doesn't catch my arms or my face. I feel confident when I use the stock pot. I can put a lid on it (in case of fire) and peer down inside the pot and feel safe. NOTE: I cut my chicken into 8 pieces and I should have cut it into 10. The chicken breasts were WAY too big. My next video may be how to do THAT! May all of your chicken be crispy and delicious! You learn something every day, and today I learned how to make three kinds of buttermilk. I'm looking forward to frying some chicken for my family using your recipe. Adding short videos was a nice touch. Nikki, I'm with you -- no "mere centimeter between the rim of the pan and a kitchen fire" for me! I always cut the chicken into 10 instead of 8 and do the buttermilk thing and "double-dipping." 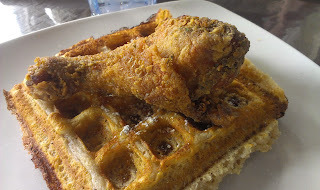 A real Southern fried chicken dinner like Grandma used to make is not something to be rushed!